Excessive consumption of fructose may contribute to insulin resistance, obesity, elevated LDL cholesterol and triglycerides, leading to metabolic syndrome, type 2 diabetes and cardiovascular disease. The European Food Safety Authority stated that fructose is preferable over sucrose and glucose in sugar-sweetened foods and beverages because of its lower effect on postprandial blood sugar levels, and also noted that "high intakes of fructose may lead to metabolic complications such as dyslipidaemia, insulin resistance, and increased visceral adiposity". Further, the UK’s Scientific Advisory Committee on Nutrition in 2015 disputed the claims of fructose causing metabolic disorders, stating that "there is insufficient evidence to demonstrate that fructose intake leads to adverse health outcomes independent of any effects related to its presence as a component of total and free sugars." The word "fructose" was coined in 1857 from the Latin for fructus (fruit) and the generic chemical suffix for sugars, -ose. It is also called fruit sugar and levulose. Fructose is a 6-carbon polyhydroxyketone. Crystalline fructose adopts a cyclic six-membered structure owing to the stability of its hemiketal and internal hydrogen-bonding. This form is formally called D-fructopyranose. In water solution, fructose exists as an equilibrium mixture of 70% fructopyranose and about 22% fructofuranose, as well as small amounts of three other forms, including the acyclic structure. Fructose may be anaerobically fermented by yeast or bacteria. Yeast enzymes convert sugar (glucose, or fructose) to ethanol and carbon dioxide. The carbon dioxide released during fermentation will remain dissolved in water, where it will reach equilibrium with carbonic acid, unless the fermentation chamber is left open to the air. The dissolved carbon dioxide and carbonic acid produce the carbonation in bottled fermented beverages. Fructose undergoes the Maillard reaction, non-enzymatic browning, with amino acids. Because fructose exists to a greater extent in the open-chain form than does glucose, the initial stages of the Maillard reaction occur more rapidly than with glucose. Therefore, fructose has potential to contribute to changes in food palatability, as well as other nutritional effects, such as excessive browning, volume and tenderness reduction during cake preparation, and formation of mutagenic compounds. Fructose readily dehydrates to give hydroxymethylfurfural ("HMF"). This process, in the future, may become part of a low-cost, carbon-neutral system to produce replacements for petrol and diesel from plants. The primary reason that fructose is used commercially in foods and beverages, besides its low cost, is its high relative sweetness. It is the sweetest of all naturally occurring carbohydrates. The relative sweetness of fructose has been reported in the range of 1.2–1.8 times that of sucrose. However, it is the 6-membered ring form of fructose that is sweeter; the 5-membered ring form tastes about the same as usual table sugar. Warming fructose leads to formation of the 5-membered ring form. Therefore, the relative sweetness decreases with increasing temperature. However it has been observed that the absolute sweetness of fructose is identical at 5 °C as 50 °C and thus the relative sweetness to sucrose is not due to anomeric distribution but a decrease in the absolute sweetness of sucrose at lower temperatures. The sweetness of fructose is perceived earlier than that of sucrose or glucose, and the taste sensation reaches a peak (higher than that of sucrose) and diminishes more quickly than that of sucrose. Fructose can also enhance other flavors in the system. Fructose exhibits a sweetness synergy effect when used in combination with other sweeteners. 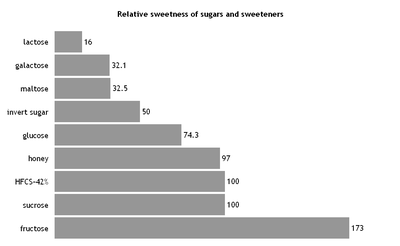 The relative sweetness of fructose blended with sucrose, aspartame, or saccharin is perceived to be greater than the sweetness calculated from individual components. Fructose has higher water solubility than other sugars, as well as other sugar alcohols. Fructose is, therefore, difficult to crystallize from an aqueous solution. Sugar mixes containing fructose, such as candies, are softer than those containing other sugars because of the greater solubility of fructose. Fructose is quicker to absorb moisture and slower to release it to the environment than sucrose, glucose, or other nutritive sweeteners. Fructose is an excellent humectant and retains moisture for a long period of time even at low relative humidity (RH). Therefore, fructose can contribute a more palatable texture, and longer shelf life to the food products in which it is used. Fructose has a greater effect on freezing point depression than disaccharides or oligosaccharides, which may protect the integrity of cell walls of fruit by reducing ice crystal formation. However, this characteristic may be undesirable in soft-serve or hard-frozen dairy desserts. Fructose increases starch viscosity more rapidly and achieves a higher final viscosity than sucrose because fructose lowers the temperature required during gelatinizing of starch, causing a greater final viscosity. Although some artificial sweeteners are not suitable for home-baking, many traditional recipes use fructose. Natural sources of fructose include fruits, vegetables (including sugar cane), and honey. Fructose is often further concentrated from these sources. The highest dietary sources of fructose, besides pure crystalline fructose, are foods containing table sugar (sucrose), high-fructose corn syrup, agave nectar, honey, molasses, maple syrup, fruit and fruit juices, as these have the highest percentages of fructose (including fructose in sucrose) per serving compared to other common foods and ingredients. Fructose exists in foods either as a free monosaccharide or bound to glucose as sucrose, a disaccharide. Fructose, glucose, and sucrose may all be present in a food; however, different foods will have varying levels of each of these three sugars. The sugar contents of common fruits and vegetables are presented in Table 1. In general, in foods that contain free fructose, the ratio of fructose to glucose is approximately 1:1; that is, foods with fructose usually contain about an equal amount of free glucose. A value that is above 1 indicates a higher proportion of fructose to glucose, and below 1 a lower proportion. Some fruits have larger proportions of fructose to glucose compared to others. For example, apples and pears contain more than twice as much free fructose as glucose, while for apricots the proportion is less than half as much fructose as glucose. Apple and pear juices are of particular interest to pediatricians because the high concentrations of free fructose in these juices can cause diarrhea in children. The cells (enterocytes) that line children's small intestines have less affinity for fructose absorption than for glucose and sucrose. Unabsorbed fructose creates higher osmolarity in the small intestine, which draws water into the gastrointestinal tract, resulting in osmotic diarrhea. This phenomenon is discussed in greater detail in the Health Effects section. Table 1 also shows the amount of sucrose found in common fruits and vegetables. Sugarcane and sugar beet have a high concentration of sucrose, and are used for commercial preparation of pure sucrose. Extracted cane or beet juice is clarified, removing impurities; and concentrated by removing excess water. The end-product is 99.9%-pure sucrose. Sucrose-containing sugars include common table white granulated sugar and powdered sugar, as well as brown sugar. All data with a unit of g (gram) are based on 100 g of a food item. The fructose/glucose ratio is calculated by dividing the sum of free fructose plus half sucrose by the sum of free glucose plus half sucrose. Fructose is also found in the manufactured sweetener, high-fructose corn syrup (HFCS), which is produced by treating corn syrup with enzymes, converting glucose into fructose. The common designations for fructose content, HFCS-42 and HFCS-55, indicate the percentage of fructose present in HFCS. HFCS-55 is commonly used as a sweetener for soft drinks, whereas HFCS-42 is used to sweeten processed foods, breakfast cereals, bakery foods, and some soft drinks. Data obtained from Kretchmer, N. & Hollenbeck, CB (1991). Sugars and Sweeteners, Boca Raton, FL: CRC Press, Inc. for HFCS, and USDA for fruits and vegetables and the other refined sugars. Cane and beet sugars have been used as the major sweetener in food manufacturing for centuries. However, with the development of HFCS, a significant shift occurred in the type of sweetener consumption in certain countries, particularly the United States. Contrary to the popular belief, however, with the increase of HFCS consumption, the total fructose intake relative to the total glucose intake has not dramatically changed. Granulated sugar is 99.9%-pure sucrose, which means that it has equal ratio of fructose to glucose. The most commonly used forms of HFCS, HFCS-42, and HFCS-55, have a roughly equal ratio of fructose to glucose, with minor differences. HFCS has simply replaced sucrose as a sweetener. Therefore, despite the changes in the sweetener consumption, the ratio of glucose to fructose intake has remained relatively constant. Providing 368 kcal per 100 grams of dry powder (table), fructose has 95% the caloric value of sucrose by weight. Fructose powder is 100% carbohydrates and supplies no nutrients in significant content (table). Fructose exists in foods either as a monosaccharide (free fructose) or as a unit of a disaccharide (sucrose). Free fructose is absorbed directly by the intestine. When fructose is consumed in the form of sucrose, it is digested (broken down) and then absorbed as free fructose. As sucrose comes into contact with the membrane of the small intestine, the enzyme sucrase catalyzes the cleavage of sucrose to yield one glucose unit and one fructose unit, which are then each absorbed. After absorption, it enters the hepatic portal vein and is directed toward the liver. The absorption capacity for fructose in monosaccharide form ranges from less than 5 g to 50 g (per individual serving) and adapts with changes in dietary fructose intake. Studies show the greatest absorption rate occurs when glucose and fructose are administered in equal quantities. When fructose is ingested as part of the disaccharide sucrose, absorption capacity is much higher because fructose exists in a 1:1 ratio with glucose. It appears that the GLUT5 transfer rate may be saturated at low levels, and absorption is increased through joint absorption with glucose. One proposed mechanism for this phenomenon is a glucose-dependent cotransport of fructose. In addition, fructose transfer activity increases with dietary fructose intake. The presence of fructose in the lumen causes increased mRNA transcription of GLUT5, leading to increased transport proteins. High-fructose diets (>2.4 g/kg body wt) increase transport proteins within three days of intake. Several studies have measured the intestinal absorption of fructose using the hydrogen breath test. These studies indicate that fructose is not completely absorbed in the small intestine. When fructose is not absorbed in the small intestine, it is transported into the large intestine, where it is fermented by the colonic flora. Hydrogen is produced during the fermentation process and dissolves into the blood of the portal vein. This hydrogen is transported to the lungs, where it is exchanged across the lungs and is measurable by the hydrogen breath test. The colonic flora also produces carbon dioxide, short-chain fatty acids, organic acids, and trace gases in the presence of unabsorbed fructose. The presence of gases and organic acids in the large intestine causes gastrointestinal symptoms such as bloating, diarrhea, flatulence, and gastrointestial pain Exercise immediately after consumption can exacerbate these symptoms by decreasing transit time in the small intestine, resulting in a greater amount of fructose emptied into the large intestine. All three dietary monosaccharides are transported into the liver by the GLUT2 transporter. Fructose and galactose are phosphorylated in the liver by fructokinase (Km= 0.5 mM) and galactokinase (Km = 0.8 mM), respectively. By contrast, glucose tends to pass through the liver (Km of hepatic glucokinase = 10 mM) and can be metabolised anywhere in the body. Uptake of fructose by the liver is not regulated by insulin. However, insulin is capable of increasing the abundance and functional activity of GLUT5 in skeletal muscle cells. The initial catabolism of fructose is sometimes referred to as fructolysis, in analogy with glycolysis, the catabolism of glucose. In fructolysis, the enzyme fructokinase initially produces fructose 1-phosphate, which is split by aldolase B to produce the trioses dihydroxyacetone phosphate (DHAP) and glyceraldehyde . Unlike glycolysis, in fructolysis the triose glyceraldehyde lacks a phosphate group. A third enzyme, triokinase, is therefore required to phosphorylate glyceraldehyde, producing glyceraldehyde 3-phosphate. The resulting trioses are identical to those obtained in glycolysis and can enter the gluconeogenic pathway for glucose or glycogen synthesis, or be further catabolized through the lower glycolytic pathway to pyruvate. The first step in the metabolism of fructose is the phosphorylation of fructose to fructose 1-phosphate by fructokinase, thus trapping fructose for metabolism in the liver. Fructose 1-phosphate then undergoes hydrolysis by aldolase B to form DHAP and glyceraldehydes; DHAP can either be isomerized to glyceraldehyde 3-phosphate by triosephosphate isomerase or undergo reduction to glycerol 3-phosphate by glycerol 3-phosphate dehydrogenase. The glyceraldehyde produced may also be converted to glyceraldehyde 3-phosphate by glyceraldehyde kinase or further converted to glycerol 3-phosphate by glycerol 3-phosphate dehydrogenase. The metabolism of fructose at this point yields intermediates in the gluconeogenic pathway leading to glycogen synthesis as well as fatty acid and triglyceride synthesis. The resultant glyceraldehyde formed by aldolase B then undergoes phosphorylation to glyceraldehyde 3-phosphate. Increased concentrations of DHAP and glyceraldehyde 3-phosphate in the liver drive the gluconeogenic pathway toward glucose and subsequent glycogen synthesis. It appears that fructose is a better substrate for glycogen synthesis than glucose and that glycogen replenishment takes precedence over triglyceride formation. Once liver glycogen is replenished, the intermediates of fructose metabolism are primarily directed toward triglyceride synthesis. Carbons from dietary fructose are found in both the free fatty acid and glycerol moieties of plasma triglycerides. High fructose consumption can lead to excess pyruvate production, causing a buildup of Krebs cycle intermediates. Accumulated citrate can be transported from the mitochondria into the cytosol of hepatocytes, converted to acetyl CoA by citrate lyase and directed toward fatty acid synthesis. In addition, DHAP can be converted to glycerol 3-phosphate, providing the glycerol backbone for the triglyceride molecule. Triglycerides are incorporated into very-low-density lipoproteins (VLDL), which are released from the liver destined toward peripheral tissues for storage in both fat and muscle cells. In a meta-analysis of clinical trials with controlled feeding — where test subjects were fed a fixed amount of energy rather than being allowed to choose the amount they ate — fructose was not an independent factor for weight gain; however, fructose consumption was associated with weight gain when the fructose provided excess calories. An expert panel of the European Food Safety Authority concluded that fructose is preferred in food and beverage manufacturing to replace sucrose and glucose due to the lower effect of fructose on blood glucose levels following a meal. However, as a common sweetening agent for foods and beverages, fructose has been associated with increased risk of obesity, diabetes, and cardiovascular disorders that are part of metabolic syndrome. Clinical research has provided no or only limited direct evidence that fructose itself is associated with elevated LDL cholesterol and triglycerides leading to metabolic syndrome, but rather indicates that excessive consumption of sugar-sweetened foods and beverages, and the concurrent increase in calorie intake, underlies metabolic syndrome. Similarly, increased consumption of sweetened foods and beverages raises risk of cardiovascular disease, including hypertension, but there is no direct cause and effect relationship in humans showing that fructose is the causative factor. Fructose is often recommended for diabetics because it does not trigger the production of insulin by pancreatic β cells, probably because β cells have low levels of GLUT5, For a 50 gram reference amount, fructose has a glycemic index of 23, compared with 100 for glucose and 60 for sucrose. Fructose is also 73% sweeter than sucrose at room temperature, allowing diabetics to use less of it per serving. Fructose consumed before a meal may reduce the glycemic response of the meal. Fructose-sweetened food and beverage products cause less of a rise in blood glucose levels than do those manufactured with either sucrose or glucose. ^ "Fructose – Definition and More from the Free Merriam-Webster Dictionary". Mw4.m-w.com. Archived from the original on 5 June 2013. Retrieved 10 December 2014. ^ Levulose comes from the Latin word laevus, levo, "left side", levulose is the old word for the most occurring isomer of fructose. D-fructose rotates plane-polarised light to the left, hence the name. "Levulose". Archived from the original on 2009-10-08. Retrieved 2010-01-28. .
^ CRC Handbook of Chemistry and Physics, 49th edition, 1968-1969, p. D-186. ^ Michael Chambers. "ChemIDplus – 57-48-7 – BJHIKXHVCXFQLS-UYFOZJQFSA-N – Fructose [USP:JAN] – Similar structures search, synonyms, formulas, resource links, and other chemical information". Chem.sis.nlm.nih.gov. Archived from the original on 10 December 2014. Retrieved 10 December 2014. ^ Dubrunfaut (1847) "Sur une propriété analytique des fermentations alcoolique et lactique, et sur leur application à l’étude des sucres" Archived 2014-06-27 at the Wayback Machine (On an analytic property of alcoholic and lactic fermentations, and on their application to the study of sugars), Annales de Chimie et de Physique, 21 : 169–178. On page 174, Dubrunfaut relates the discovery and properties of fructose. ^ a b William Allen Miller (1857). Elements of Chemistry: Theoretical and Practical, Part III. Organic Chemistry; pages 52 and 57. John W. Parker and son, London, England. Archived from the original on 2014-06-27. ^ Hyvonen, L. & Koivistoinen, P (1982). "Fructose in Food Systems". In Birch, G.G. & Parker, K.J. Nutritive Sweeteners. London & New Jersey: Applied Science Publishers. pp. 133–144. ISBN 978-0-85334-997-6. ^ a b c d Malik, Vasanti S.; Hu, Frank B. (2015). "Fructose and Cardiometabolic Health: What the Evidence from Sugar-Sweetened Beverages Tells Us". Journal of the American College of Cardiology. 66 (14): 1615–1624. doi:10.1016/j.jacc.2015.08.025. ISSN 0735-1097. PMC 4592517. PMID 26429086. ^ Rippe, James M.; Angelopoulos, Theodore J. (2015-07-01). "Fructose-containing sugars and cardiovascular disease". Advances in Nutrition (Bethesda, Md.). 6 (4): 430–439. doi:10.3945/an.114.008177. ISSN 2156-5376. PMC 4496738. PMID 26178027. ^ a b c EFSA Panel on Dietetic Products, Nutrition and Allergies (2011). "Scientific Opinion on the substantiation of health claims related to fructose and reduction of post-prandial glycaemic responses (ID 558) pursuant to Article 13(1) of Regulation (EC) No 1924/2006". EFSA Journal. 9 (6): 2223. doi:10.2903/j.efsa.2011.2223. ^ "Carbohydrates and Health" (PDF). UK Scientific Advisory Committee on Nutrition, Public Health England, TSO, Williams Lea, Norwich, UK. 2015. Archived (PDF) from the original on 19 March 2016. Retrieved 1 April 2016. ^ a b "Fructose. Origin and meaning of fructose". Online Etymology Dictionary, Douglas Harper. 2017. Archived from the original on 25 December 2017. Retrieved 24 December 2017. ^ "Institute of Organic Chemistry". Archived from the original on 2008-04-16. ^ McWilliams, Margaret (2001). Foods: Experimental Perspectives, 4th Edition. ISBN 978-0-13-021282-5. ^ Keusch, P. "Yeast and Sugar- the Chemistry must be right". Archived from the original on December 20, 2010. ^ Dills, WL (1993). "Protein fructosylation: Fructose and the Maillard reaction". Journal of Clinical Nutrition. 58: 779–787. ^ a b c d e Hanover, L. M.; White, J. S. (1 November 1993). "Manufacturing, composition, and applications of fructose". The American Journal of Clinical Nutrition. 58 (5): 724S–732S. ISSN 0002-9165. Archived from the original on 14 April 2016. Retrieved 7 February 2017. ^ a b c d Lee, Thomas D. (1 January 2000). Sweeteners. Kirk-Othmer Encyclopedia of Chemical Technology. doi:10.1002/0471238961.19230505120505.a01.pub2. ISBN 978-0471238966. ^ Jana, A.H.; Joshi, N.S.S. (November 1994). "Sweeteners for frozen [desserts] success – a review". Australian Journal of Dairy Technology. 49. Archived from the original on 8 February 2017. Retrieved 7 February 2017. ^ Shallenberger, R.S. (1994). Taste Chemistry. Chapman and Hall. ISBN 978-0-7514-0150-9. ^ a b Nabors, LO (2001). "American Sweeteners": 374–375. ^ McWilliams, Margaret (2001). Foods: Experimental Perspectives, 4th Edition. Upper Saddle River, NJ : Prentice Hall. ISBN 978-0-13-021282-5. ^ White, DC; Lauer GN (1990). "Predicting gelatinization temperature of starch/sweetener system for cake formulation by differential scanning calorimetry I. Development of a model". Cereal Foods World. 35: 728–731. ^ Margaret M. Wittenberg (2007). New Good Food: Essential Ingredients for Cooking and Eating Well. Diet and Nutrition Series; pages 249–51. Ten Speed Press. ISBN 978-1580087506. Archived from the original on 2018-02-23. ^ Park, KY; Yetley AE (1993). "Intakes and food sources of fructose in the United States". American Journal of Clinical Nutrition. 58 (5 Suppl): 737S–747S. doi:10.1093/ajcn/58.5.737S. PMID 8213605. ^ Riby, JE; Fujisawa T; Kretchmer N (1993). "Fructose absorption". American Journal of Clinical Nutrition. 58 (5 Suppl): 748S–753S. doi:10.1093/ajcn/58.5.748S. PMID 8213606. ^ a b Kretchmer, N; Hollenbeck CB (1991). "Sugars and Sweeteners". CRC Press, Inc.
^ a b "Search the USDA National Nutrient Database for Standard Reference". Nal.usda.gov. Archived from the original on 3 March 2015. Retrieved 10 December 2014. ^ a b c "High Fructose Corn Syrup: Questions and Answers". US Food and Drug Administration. 5 November 2014. Archived from the original on 25 January 2018. Retrieved 18 December 2017. ^ White, J. S (2008). "Straight talk about high-fructose corn syrup: What it is and what it ain't". American Journal of Clinical Nutrition. 88 (6): 1716S–1721S. doi:10.3945/ajcn.2008.25825B. PMID 19064536. Archived from the original on 2016-04-12. ^ Guthrie, FJ; Morton FJ (2000). "Food sources of added sweeteners in the diets of Americans". Journal of the American Dietetic Association. 100 (1): 43–51. doi:10.1016/S0002-8223(00)00018-3. PMID 10646004. ^ "Calories and nutrient composition for fructose, dry powder per 100 g". USDA National Nutrient Database, version SR-28. May 2016. Archived from the original on 2017-02-08. ^ "Calories and nutrient composition for sucrose granules per 100 g". USDA National Nutrient Database, version SR-28. May 2016. Archived from the original on 2017-02-08. ^ a b Fujisawa, T; Riby J; Kretchmer N (1991). "Intestinal absorption of fructose in the rat". Gastroenterology. 101 (2): 360–367. PMID 2065911. ^ Ushijima, K; Fujisawa T; Riby J; Kretchmer N (1991). "Absorption of fructose by isolated small intestine of rats is via a specific saturable carrier in the absence of glucose and by the disaccharidase-related transport system in the presence of glucose". Journal of Nutrition. 125 (8): 2156–2164. doi:10.1093/jn/125.8.2156. PMID 7643250. ^ Ferraris, R (2001). "Dietary and developmental regulation of intestinal sugar transport". Journal of Biochemistry. 360 (Pt 2): 265–276. doi:10.1042/0264-6021:3600265. PMC 1222226. PMID 11716754. ^ a b Beyer, PL; Caviar EM; McCallum RW (2005). "Fructose intake at current levels in the United States may cause gastrointestinal distress in normal adults". J. Am. Diet. Assoc. 105 (10): 1559–1566. doi:10.1016/j.jada.2005.07.002. PMID 16183355. ^ Ravich, WJ; Bayless TM; Thomas, M (1983). "Fructose: incomplete intestinal absorption in humans". Gastroenterology. 84 (1): 26–29. PMID 6847852. ^ Riby, JE; Fujisawa T; Kretchmer, N (1993). "Fructose absorption". American Journal of Clinical Nutrition. 58 (5 Suppl): 748S–753S. PMID 8213606. ^ Rumessen, JJ; Gudman-Hoyer E (1986). "Absorption capacity of fructose in healthy adults. Comparison with sucrose and its constituent monosaccharides". Gut. 27 (10): 1161–1168. doi:10.1136/gut.27.10.1161. PMC 1433856. PMID 3781328. ^ Skoog, SM; Bharucha AE (2004). "Dietary fructose and gastrointestinal symptoms: a review". Am. J. Gastroenterol. 99 (10): 2046–50. doi:10.1111/j.1572-0241.2004.40266.x. PMID 15447771. ^ Fujisawa, T, T; Mulligan K; Wada L; Schumacher L; Riby J; Kretchmer N (1993). "The effect of exercise on fructose absorption". Am. J. Clin. Nutr. 58 (1): 75–9. doi:10.1093/ajcn/58.1.75. PMID 8317393. ^ Quezada-Calvillo, R; Robayo CC; Nichols BL (2006). Carbohydrate Digestion and Absorption. Missouri: Saunders, Elsevier. pp. 182–185. ISBN 978-1-4160-0209-3. ^ Hajduch, E; Litherland GJ; Turban S; Brot-Laroche E; Hundal HS (Aug 2003). "Insulin regulates the expression of the GLUT5 transporter in L6 skeletal muscle cells". FEBS Letters. 549 (1–3): 77–82. doi:10.1016/S0014-5793(03)00773-7. PMID 12914929. ^ MA Parniak; Kalant N (1988). "Enhancement of glycogen concentrations in primary cultures of rat hepatocytes exposed to glucose and fructose". Biochemical Journal. 251 (3): 795–802. doi:10.1042/bj2510795. PMC 1149073. PMID 3415647. ^ Jia, Guanghong; Aroor, Annayya R.; Whaley-Connell, Adam T.; Sowers, James R. (June 2014). "Fructose and Uric Acid: Is There a Role in Endothelial Function?". Current Hypertension Reports. 16 (6). doi:10.1007/s11906-014-0434-z. ISSN 1522-6417. PMC 4084511. ^ Medina Villaamil (2011-02-01). "Fructose transporter Glut5 expression in clear renal cell carcinoma". Oncology Reports. 25 (2). doi:10.3892/or.2010.1096. ISSN 1021-335X. ^ a b McGrane, MM (2006). Carbohydrate metabolism: Synthesis and oxidation. Missouri: Saunders, Elsevier. pp. 258–277. ISBN 978-1-4160-0209-3. ^ a b Sul, HS (2006). Metabolism of Fatty Acids, Acylglycerols, and Sphingolipids. Missouri: Saunders, Elsevier. pp. 450–467. ISBN 978-1-4160-0209-3. ^ Sievenpiper JL, de Souza RJ, Mirrahimi A, Yu ME, Carleton AJ, Beyene J, Chiavaroli L, Di Buono M, Jenkins AL, Leiter LA, Wolever TM, Kendall CW, Jenkins DJ (Feb 21, 2012). "Effect of Fructose on Body Weight in Controlled Feeding Trials: A Systematic Review and Meta-analysis". Ann Intern Med. 156 (4): 291–304. doi:10.7326/0003-4819-156-4-201202210-00007. PMID 22351714. ^ Bantle, J. P.; Raatz, S. K.; Thomas, W.; Georgopoulos, A. (2000-11-01). "Effects of dietary fructose on plasma lipids in healthy subjects". The American Journal of Clinical Nutrition. 72 (5): 1128–1134. doi:10.1093/ajcn/72.5.1128. ISSN 0002-9165. PMID 11063439. ^ Rippe, J. M.; Angelopoulos, T. J. (2015). "Fructose-Containing Sugars and Cardiovascular Disease". Advances in Nutrition. 6 (4): 430–439. doi:10.3945/an.114.008177. ISSN 2156-5376. PMC 4496738. PMID 26178027. ^ Bray, George A. (2013-03-01). "Energy and fructose from beverages sweetened with sugar or high-fructose corn syrup pose a health risk for some people". Advances in Nutrition (Bethesda, Md.). 4 (2): 220–225. doi:10.3945/an.112.002816. ISSN 2156-5376. PMC 3649102. PMID 23493538. ^ A. M. Grant; M. R. Christie; S. J. Ashcroft (August 1980). "Insulin Release from Human Pancreatic Islets in Vitro". Diabetologia. 19 (2): 114–117. doi:10.1007/BF00421856. PMID 6998814. ^ "Glycemic index". Glycemic Index Testing and Research, University of Sydney (Australia) Glycemic Index Research Service (SUGiRS). 2 May 2017. Retrieved 23 February 2018. ^ Patricia M. Heacock; Steven R. Hertzler; Bryan W. Wolf (2002). "Fructose Prefeeding Reduces the Glycemic Response to a High-Glycemic Index, Starchy Food in Humans". Journal of Nutrition. 132 (9): 2601–2604. doi:10.1093/jn/132.9.2601. PMID 12221216. Archived from the original on 2008-10-06.